Fans of buffalo wings will love this dinner recipe! 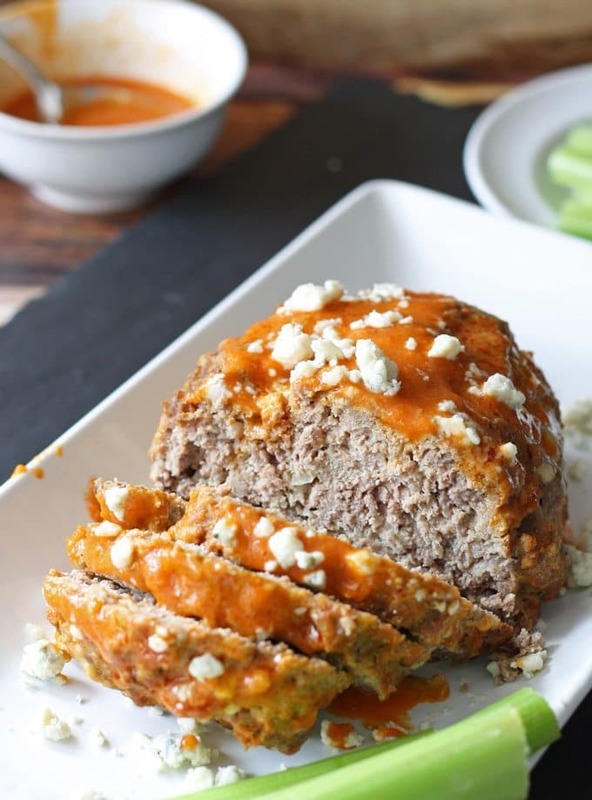 Buffalo meatloaf, stuffed with blue cheese and glazed with buffalo sauce. I was taking a peak through my recipe index and realized that most of my dinner recipes are made in a slow cooker. I own a couple of the 6 quart ones (like this one – affiliate link.) And I like to cook a lot of things at one time – the slow cooker is my friend. I like it so much that I often forget about the oven. Even in the winter, when it could help warm up my home. It’s Chicago, it is cold – I’ll do anything to get warm. I digress. So, I was going through my recipe index, thinking about dinner and the oven and it came to me. Make a meatloaf. 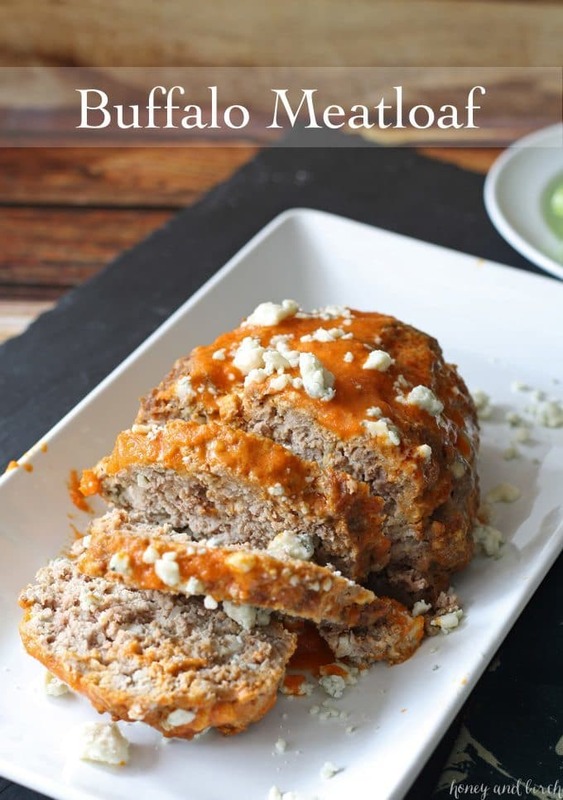 And thanks to my homemade buffalo sauce recipe, make a buffalo meatloaf recipe. Don’t be confused, this meatloaf contains a lot of meat, but none of it is buffalo meat. I’m sure you figured it out from the pictures, but when I told my mom I was making it, she wanted to know where I found buffalo meat at the store. Instead, I used a combination of beef, turkey and pork and my favorite cheese of all, blue. And a lot of it. The buffalo name comes from a healthy dose of buffalo sauce, slathered across the top. Sooo good. If you like buffalo sauce as much as me, you can always use more – don’t be stingy with it. When cooking, I highly recommend using a thermometer to check the temperature instead of using the time I gave. Every oven is different, as I’m sure you know if you have ever been frustrated with a recipe that took longer or less time to cook than was written. Chances are, it was your oven cooking differently from the recipe writer’s. Wow, lots of digression today…. anyway, I cooked this using a baking sheet lined with foil and a quick (very quick) mist of cooking spray. You could also use a baking dish. Preheat oven to 350 degrees. In a large bowl, combine the turkey, sirloin, pork, onion, blue cheese crumbles, eggs, garlic, breadcrumbs and pepper. I recommend using your hands to ensure that it is well combined. Separate the meat into two equal sections and form them into loaf shapes. Place them on a baking sheet or dish evenly apart. Bake uncovered for 1 hour, or until the internal temperature of the loaves reaches 165 degrees. When you remove the loaves from the oven, brush the buffalo sauce on top of the cooked loaves, 1/4 cup per loaf. 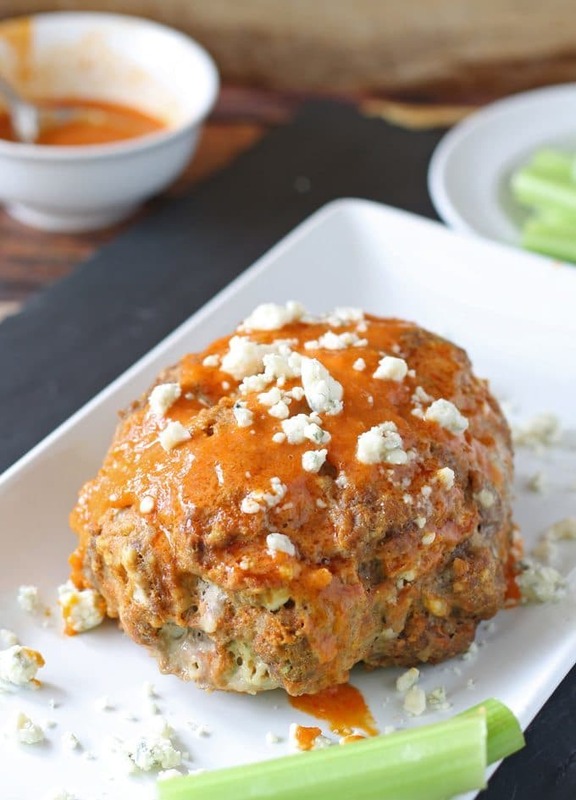 When serving, sprinkle buffalo sauce and blue cheese over meatloaf pieces. This looks amazing Jenny! I love using the oven especially these days because I can usually even turn off the heat because the oven warms up our (tiny) apartment! I love buffalo sauce too and this is such a great meal 🙂 Pinning this for sure! This sounds amazing! My mouth is watering. Pinned to make it later. 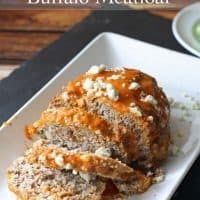 I love this idea for meatloaf. It looks delicious! 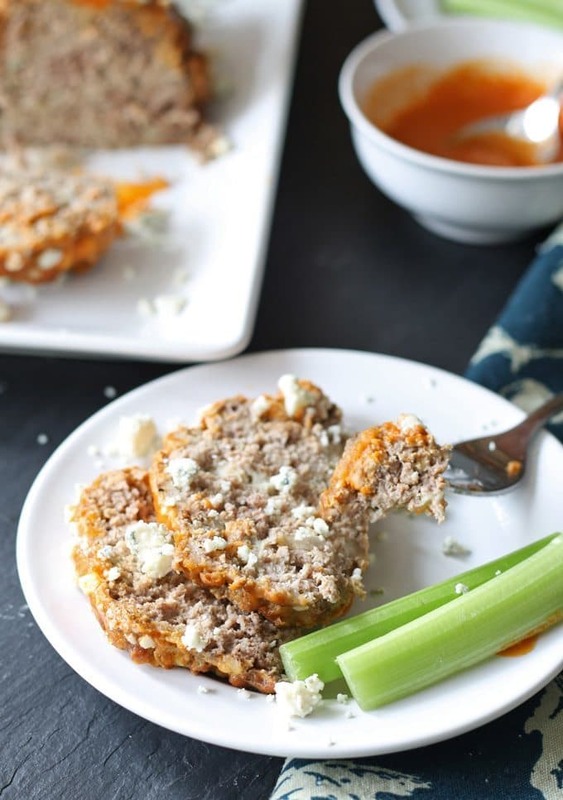 Love the idea of the blue cheese in this meatloaf 🙂 Thank you so much for attending week 19 of #PureBlogLove and linking your fantastic blog post, I can’t wait to see what you have in store for our next party, Thursday 8 PM EST- Sundays at midnight. Your post has been added to the #PureBlogLove Pinterest board for all to see 🙂 Have a great day!